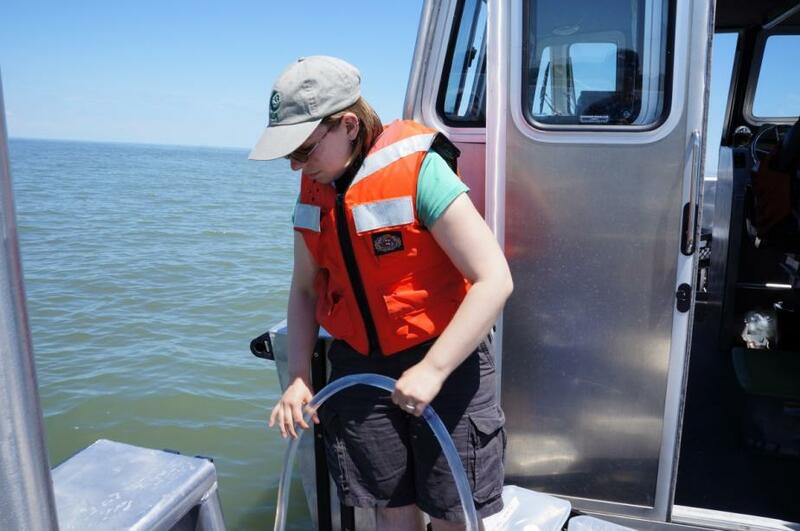 The GLC is part of a long-term monitoring project on Lake Erie. Several state and federal agencies in the US and Canada sample at sites around the lake. The GLC collects data every two weeks at two stations near Buffalo, NY. Katie Hastings using a data sonde to collect a vertical profile of the water column. Katie is the main researcher on this project. Katie Hastings recording data from the sonde. Katie Hastings collects a water sample using a sampling tube. Mark Clapsadl sitting on the back deck of the boat with the monitoring equipment. Mark Clapsadl pouring water into bottles for chlorophyll analysis. Mark Clapsadl using a zooplankton net. Mark Clapsadl pouring a zooplankton sample from the net into a bottle. Katie Hastings filters the water samples to extract the chlorophyll, then grinds sample filters in an acetone solution. The samples are centrifuged to settle all of the filter fibers out. The clarified sample is decanted into a cuvette. Katie places extracted chlorophyll samples in the spectrophotometer to determine the chlorophyll concentration in the water samples.